Tim Kaine was recently spotted in outer space, too! What Tim Kaine wanted to achieve as Virginia's 70th governor finished second to a sometimes vexing, sometimes triumphant and sometimes heartbreaking agenda the world forced upon him. In the heady weeks before his January 2006 inauguration, Kaine readied his case for early learning programs for every prekindergarten child in Virginia. He envisioned broad reforms to the state's mental health care system. He explored ways to pump hundreds of millions of new dollars into the state's moribund highway construction efforts. That was before a student gunman killed 32 classmates and professors on a snowy April day at Virginia Tech in 2007, plunging the state deeply into grief and Kaine into the role of comforter-in-chief. That was before the worst economic collapse since the Great Depression melted away billions in projected state revenue, forcing layoffs and service cuts that now consume Kaine's final weeks in office. And it was before he almost became Barack Obama's vice president in a campaign that made Obama the first black president and the first Democrat to carry once-Confederate Virginia since 1964. In the spoils, Obama persuaded a reluctant Kaine to moonlight as Democratic National Committee chairman while serving his final year as governor. Those developments define Kaine's term, as do two failed initiatives to persuade legislative Republicans to enact new transportation revenues and his compromise with those same Republicans that effectively ended smoking in restaurants in a state dependent on tobacco from its colonial founding 400 years ago. 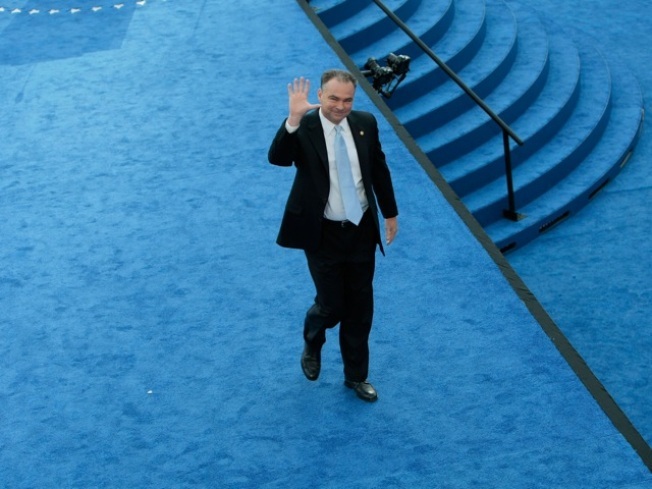 Transportation remains Kaine's chief disappointment. As gridlock traps commuters for hours daily, particularly in Washington, D.C.'s teeming suburbs, the gasoline tax revenues that pay for more and better roads tanked, a victim of recession, soaring fuel costs that reduced vehicle use and more fuel-stingy vehicles. Twice, in 2006 and 2008, Kaine convened lawmakers in special session to consider packages of new fees and taxes he proposed to ease the funding crisis, and twice a Republican-ruled House balked. Since the spring of 2008, cuts to the state's six-year road construction plan approach $6 billion, the most recent cuts coming in December. "I tell you what made me angry. It's not the people who were just voting against it out of the principle that you should never raise taxes. It's the Republican members of the House who told me, `You know, you're right, we need to do it but politically I can't buck my caucus (and) vote the way I think I should,'" Kaine said a wide-ranging conversation with The Associated Press. Now, with the Republicans' hand strengthened by resounding statewide victories and a gain of six House seats in November's elections, differences in politics become stark contrasts in policy. Kaine insists that after nearly $7 billion in budget reductions, a residual shortfall of $3.6 billion in the next budget can't be reconciled without additional revenue. "So far, all of it has been done through cuts or one-time things like the rainy day fund or swapping out cash for (debt)," Kaine said. "Somewhere, whittling down that $3.6 billion number, I'm going to get a cut that I don't want to make, that I know would be the wrong thing for Virginia." The Republican he yields the office to at noon on Jan. 16, former Attorney General Bob McDonnell, has steadfastly pledged to reject any new taxes, as have House and Senate GOP leaders. Yet as Governor Kaine anticipates his life as citizen Kaine, a kinship with his successor is unmistakable. Both men were raised in conservative, middle class Irish-Catholic homes to working parents. Kaine is Virginia's first Roman Catholic governor; McDonnell will be its second. Both came of age in the turbulent 1960s and '70s. Though those years led them on divergent political paths, the friendly relationship between them is clear when they in each other's company. Kaine, Obama's hand-picked Democratic National Committee chairman, pumped nearly $5 million in DNC cash into Virginia to defeat McDonnell and his GOP ticketmates. Yet he speaks warmly of McDonnell, generously praising his victorious campaign. His staff has sent directives to state agency chiefs for the governor-elect to prepare them for changes the new administration will make. "I find Tim to be friendly, I find him to be honest, he's affable," McDonnell said. McDonnell for years has held up Kaine's response to the aftermath of the Virginia Tech massacre as a model for leaders faced with crises of crushing horror and sadness. Kaine had just arrived in Japan on a trade mission when he was awakened in Asia's wee morning hours with word from Virginia of the worst campus shooting in U.S. history. Kaine caught the next flight home, boarded Air Force One in Washington and flew to Blacksburg with President George W. Bush. Battling exhaustion and speaking passionately with no script at a globally televised campus memorial service, Kaine lauded the community spirit Tech had shown the world through its tears. For a day, he toured hospitals to visit the wounded, and wept with parents whose children had died. "He showed an amazing amount of character," McDonnell said. "On virtually no sleep, he gave one of the most inspirational speeches I can remember." In Virginia's darkest hour, Kaine said, experience guided him. "I think I had been prepared to deal with a situation like that for a variety of reasons. I had friends whose lives had been really affected by violent crime. I've walked people into death row," said Kaine, a Harvard-schooled civil rights and criminal defense lawyer before he entered politics. Kaine appointed a fact-finding commission to review events leading up to the shooting, the faults that aggravated it, and the immediate official response. The commission's led to substantial legislative reforms, including treatment of the mentally ill and mandatory updates to the firearms background check database. Kaine treasures his four years in the Executive Mansion, but leaves it gladly. His wife, Anne Holton, had spent four years there as a child, the daughter of former Gov. A. Linwood Holton, from 1970 to 1974. But they're eager to go back home to the modest house he retained in north Richmond. Moments after he leaves office and literally exits the stage at the Inauguration, a welcome-home block party awaits him in his old neighborhood. But home can't really be the same. Now he has the Oval Office on his cell phone's speed dial, and the knowledge that its occupant will take his calls. Now, he will spend Tuesdays through Saturdays either at DNC headquarters in Washington or jetting about the country, raising cash for his party or confronting Republicans on national television. He bears a heavy burden of helping protect Democratic majorities in Congress in 2010's midterm elections after tumultuous national debates over health care reform, federal stimulus spending and energy policy. Sundays are his only day off. He will teach courses at the University of Richmond on Mondays. Republicans and the press hammered Kaine in his final year for absences from Virginia on numerous DNC trips. Kaine, however, said his dual role has benefited Virginia because of his direct access to the president. He said it began paying off immediately when Virginia faced a Bush administration bid to move some aircraft carrier groups from Norfolk's huge U.S. Navy base to Mayport, Fla.
"I was able to get the key White House decision makers on that issue the morning after inauguration to meet with me and Sen. (Jim) Webb (D-Va.) so that we could explain to them why that was a bad idea. That whole effort has been basically stopped," Kaine said. "I don't get anything I ask for because I ask for it. I am only ... successful if what I ask for has merit. But I do get to ask the decision maker," Kaine said. "I don't have to wonder if my call's going to get returned."